My wife enjoys spending time pursuing craftiness. Along these lines she is going to be going to a workshop on the shores of Squam Lake in New Hampshire in a few weeks, and will be sharing a cabin with several women from all over the country. As she is the only one driving, she decided to bring the beer. However, in keeping with the crafty theme, she decided she wanted to make her own beer. My wife likes her beers malty, but low on the ABV so she can have one or two but still function. She really likes English browns, so we came up with a recipe somewhere between a mild and a brown ale. She did all the work, I just helped walk her through it, so I take no credit for this beer. It was her ideas that guided the recipe, and her work that made the beer, I just provided the equipment and some direction. If I am lucky, she will catch the bug…and all of a sudden the idea of purchasing more fermenters will not seem like such a bad idea. Anyway, here is the recipe. OG: 1.038, FG 1.014, ABV 3.1%. This was a 45 minute infusion mash at 158F. Fermented at 68-70F. 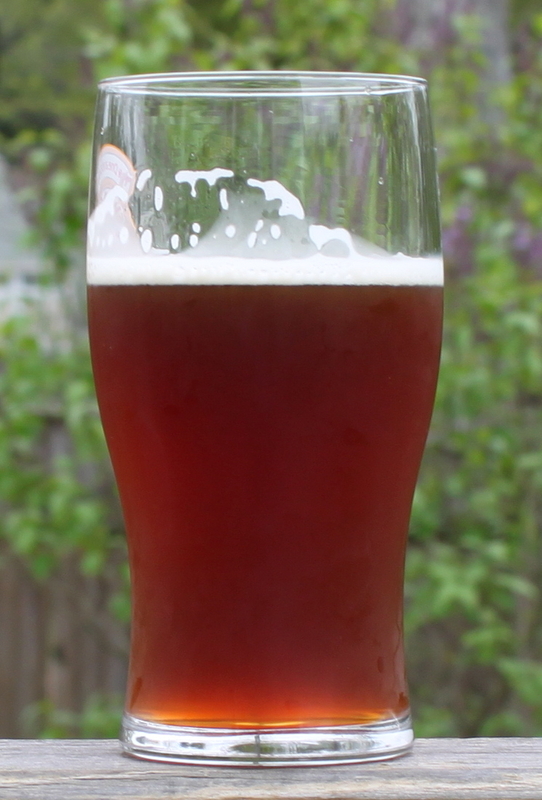 Tasting: The beer pours a deep copper color. There is about 1 finger of foam with the pour, that subsides, but does not go away, and laces down the glass. The nose has a rich breadiness with caramel and dark fruits like raisin. The taste is more of the same, starting with some fruit esters and some sweetness from the crystal malts, followed by a dry nuttiness with some more raisin and dark fruits in the background. It is fairly light, and goes down easily, and has a surprisingly dry finish. Critique — malty, easy to drink, low ABV, pretty good session beer. The yeast here is the surprise for me. I had never tried this strain before, and it is very fruity with a dry nutty finish. Looking at the recipe, I was expecting a maltier, sweeter finish. It is good, but not my favorite yeast strain I have tried. I prefer the Fullers strain (wlp 002) and Wyeast London Ale III to this. They seem to have a fuller flavor, with more malt coming through. We will certainly have no problem drinking this around the fire this summer, but next time, I think we would change up the yeast.